Special Feature: “the harp with a mohawk”! the amazing "Single-Action" mechanism The common medium harp has a mechanical lever (on each string) that raises the tone of that single string one semi-tone. For a harp this size, that would be 33 levers. Generally, these levers would only be accessible to the left hand. 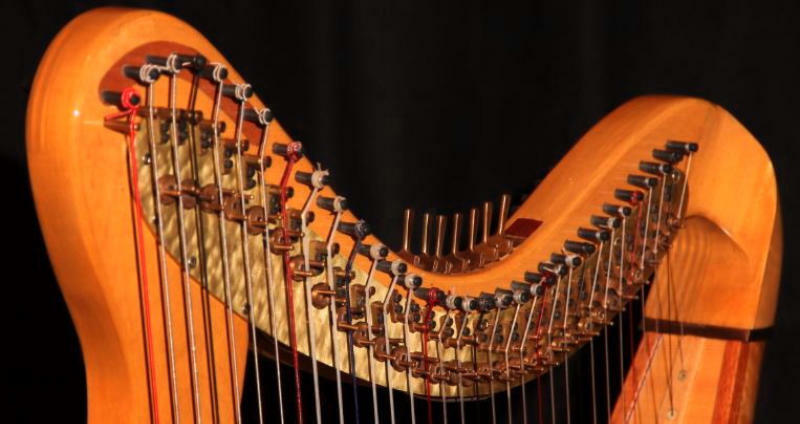 The Douglas Joy "Single-Action" harp has only seven levers. These levers are located on top of the neck, in the harmonic-curve. The first lever (closest to the player) is B. Actuating this lever raises the semi-tone of all the B strings. The subsequent levers are: A, G, F, E, D, and C. Actuating each of these levers raises the semi- tone for all of its related strings (except for the two lowest strings, which are not controlled by the action). 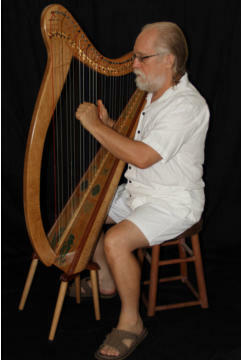 Therefore, this harp requires only one movement to change a semitone on all strings (of a certain note), as compared to five required movements on a common lever harp. Additionally, these levers are equally accessible to either hand. Finally, this harp can be tuned to allow for a variety of flat and sharp tones, complimenting a large array of music genres. Specifications Height: 44 inches without the legs; suitable for playing while sitting on a low stool, to 54 inches with legs; suitable for playing while sitting on a chair. Woods are Spruce, Maple and laminate products selected for their resonate qualities. Others woods and custom decorations are available by special order. For more information on this beautiful harp or a less-expensive student version, please contact us.